Camarillo Plant Nursery Off to a Great Start! plants on a bright and sunny day at the nursery. 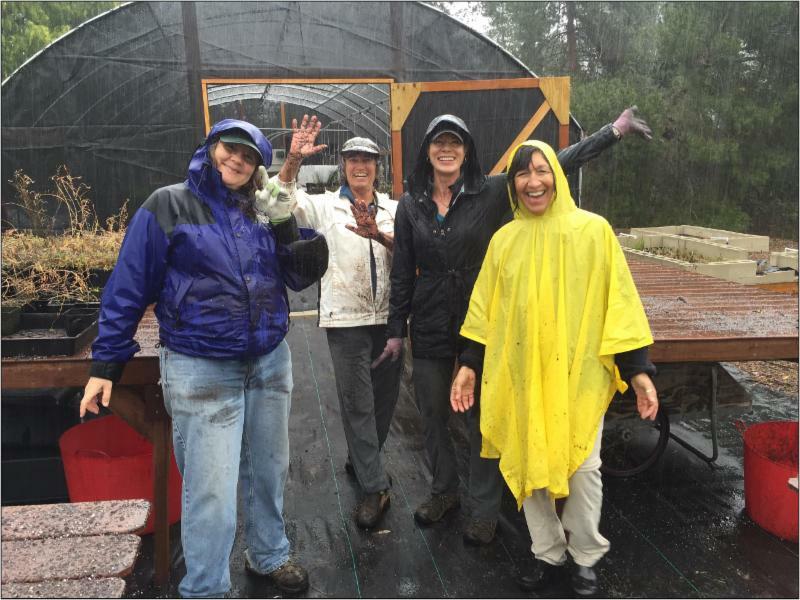 Since its construction in November last year, CIR's new native plant nursery in Camarillo has been filled with volunteers and growing native plants! We have had over 100 volunteers so far donate their time and help kick-start operations at the nursery in preparation for our new mainland restoration project at Point Mugu Naval Air Station (Pt. Mugu NAS). 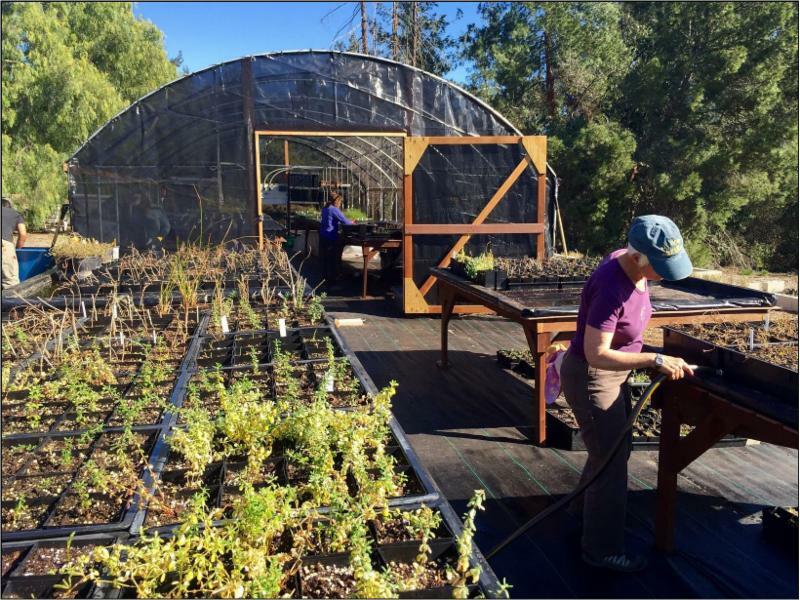 Once the nursery was built, CIR staff and volunteers collected seeds from Mugu Lagoon to grow in the nursery, and then the propagating, transplanting, and potting and re-potting of wetland plants began full-force! Volunteer tasks vary greatly, from delicate work with tiny seedlings to watering and maintaining native plants. recent rainstorm, all with smiles on their faces! Starting in April and May this year, we will be installing up to 5,000 native wetland plants that were grown in the nursery in buffer areas between roads and wetlands at Pt. Mugu NAS. These efforts will help provide habitat for native animals and provide soil stabilization, which will help protect the wetlands from erosion. This is our third project with the U.S. Navy, and those who volunteer at our nursery will get experience with wetland plants and will be considered first to get Base Access passes to volunteer at the restoration site in Pt. Mugu! estoration projects, including the project at Point Mugu Naval Air Station. This is the third native plant nursery CIR has constructed (the other two are on Anacapa and San Nicolas islands). The new facility is located at the home of Kelle Green, who manages the nursery on San Nicolas Island for CIR. The nursery consists of a shade house that is 42 feet long by 20 feet wide. Inside there are two 32 foot long benches that are about six feet in width. Water is delivered to the plants by an overhead misting system through 16 individually controlled sections on automated timers. Outside there are four 16 by 6 foot tables where plants will be held after they have matured to harden them off prior to planting. We have also constructed holding pods used for growing wetland plants. The ponds are excavated into the ground, lined with pond liner and surrounded by cider blocks and gravel. The nursery is built to the highest standards and is designed to prevent the plants from being infested with invasive species that are common in the nursery industry. The total construction cost for the facility was just under $6,000. This nursery was the brainchild of Kelle Green (volunteer extraordinaire for Channel Islands National Park and the CIR San Nicolas Island plant propagation guru). Having worked in the other nurseries constructed by CIR, Kelle dreamed of having access to a similar facility in (literally) her own backyard. About the same time, CIR was chosen to work on a restoration project at Point Mugu Naval Air Station, which included supplying 5,000 plants. CIR staff and our Board of Directors decided the time was right for us to construct our first mainland nursery to grow the plants for Mugu and for other restoration projects on the mainland. In addition to the plants for Point Mugu, CIR is currently growing plants for the San Marcos Foothills, and we are welcoming proposals to grow plants for other restoration projects. tables at the new CIR Camarillo nursery. Most of the funding for the construction cost was made possible by a generous gift from a CIR donor. Several volunteers contributed their time to construct the facility. Dave Edwards and Gordon Hart (both CIR Board members) plus John Reyes were again our lead construction team, spending many hours in the hot autumn sun working on the project. These three were also instrumental in the construction of the other CIR nurseries. Also, Barry Dydyk, Bob Nicholas, Dr. Dave Perlmutter and Kelle Green all spent many hours working on the project.